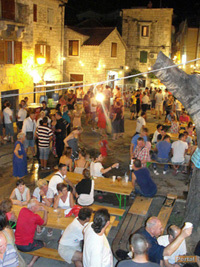 Where to have fun in Kastela? Night life in Kastela, Trogir and Split is all around cafés, clubs and local open-air festivals... You can relax, have fun and choose between all types of music, from folklore to club, performed in beautiful places by the sea, on squares or old Dalmatian streets. Of course do not miss events which are part of the most popular summer festivals.